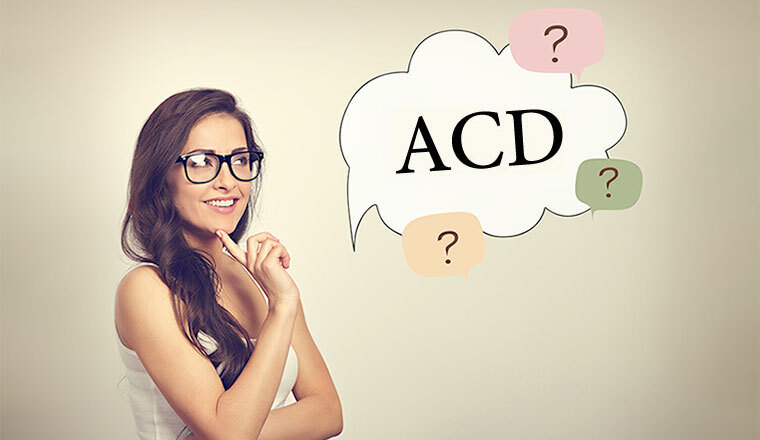 We define what an ACD (automatic call distributor) is and explain how an ACD system is used in your contact centre. An ACD system is a telephony or communications device that answers and distributes incoming contacts to a specific group of contact centre advisors within an organisation. ACDs have two main functions. Firstly, if there are no calls queuing, the ACD will route the call to the advisor who has been waiting for the longest time. Secondly, if there is a queue, the longest-waiting caller will be routed through to the next available advisor. However, as ACD systems got smarter over time they were able to route customers in more sophisticated ways. For example, ACDs can allow for a priority queue, with its algorithm distinguishing between high- and lower-value customers. This means that these different categories of customer would be placed in different queues, with high-value customers not having such a long hold time. 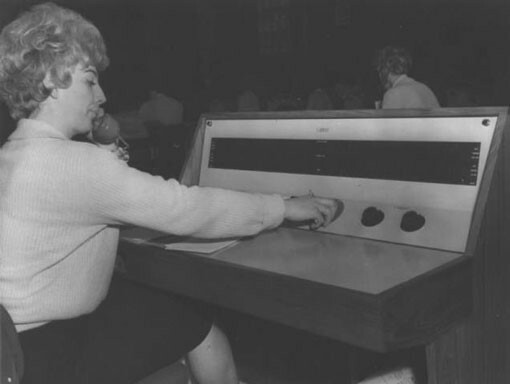 Before ACD systems, the earliest contact centres had two methods of distributing calls to advisors. First there were switchboard operators, who would identify the call type and pass the call through to the advisor who they deemed to be best suited to answer it. Then there were hunt groups, where all calls would be passed through to one specific advisor, and if they were not available, it would be passed to the next advisor and so on. So there was a designated chain of advisors that all calls would be passed through. 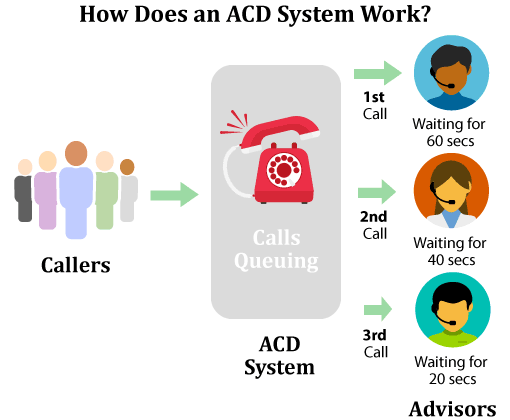 Both options were popular until the early ACDs came along, having the capability to distribute the longest-waiting call to the longest-waiting advisor. If no calls were queuing, the system could also evenly distribute calls amongst advisors, so everyone had the same workload. At first, hunt groups continued to be used just as much as ACD systems, as the option came with the telephone switchboard and ACDs were an expensive add-on. In the late 1980s, ACD technology became an add-on to PABX (Private Automated Business Exchanges) systems, which were implemented in all large-scale call centres. However, in the late 1980s, ACD technology became an add-on to PABX (Private Automated Business Exchanges) systems, which were implemented in all large-scale call centres. Since then, ACD systems have become a fundamental piece of technology. However, the algorithms have become increasingly complex, allowing the contact centre to route customers to advisors in much more advanced ways. Most modern contact centres create complicated rules for routing customers, factoring in not just the advisor availability but their skillset as well. Then we have to consider that contact centres cater for more than just voice calls. So modern ACD systems have to work conveniently with other channels that your customers use to contact you. These may include email, live chat, messaging apps, social media and video. Some contact centres have implemented ACD systems that have a single queue for managing contacts of all types, i.e. multichannel queuing. This works by pushing contacts to the next available advisor based on their skills profile. Provide important WFM stats – Data that’s stored within the ACD system can give you key information for creating metrics, forecasting/scheduling and highlighting key calls for quality analysis. This data includes handling times, calls-per-day and transfers. Route advisors across multiple sites – If you organisation has sites spanning multiple locations, the ACD system allows you to function as just one – making transfers easy. It can also allow for homeworking, although being in the cloud is equally important for this. Validate/block callers – As the ACD system can identify who is calling, the contact centre can not only prioritise calls but block certain numbers. This is useful for those callers who persist in making nuisance calls, physical threats etc. Also, if you integrate your ACD system with a number of other contact centre technologies, you will realise a number of other benefits. How Can You Improve Your ACD System? To maximise the potential of your ACD system, here are a couple of integrations that you should consider. Your CRM system will contain individual profiles for each of your customers with information such as their gender, age, address, etc. It will also contain notes of an advisor’s after-call work (ACW) – i.e. call summaries – from all of the customer’s previous interactions. However, it will likely not include other useful information such as contact type, handle times and holds/transfers, which is all held in the ACD system. So, if the CRM and ACD systems aren’t integrated, either the advisor has to go without helpful information or they have to navigate both systems while they’re on call. You can also install screen pop technology alongside your integrated ACD and CRM, which presents the customer’s information on the advisor’s desktop as soon as the customer calls in. If both systems are integrated, all this ACD information can be stored within the CRM’s customer profiles, meaning advisors can access all of the information they need in one place. But if you want to go one step further, you can also install screen pop technology alongside your integrated ACD and CRM, which presents the customer’s information on the advisor’s desktop as soon as the customer calls in. By integrating your ACD and IVR, you can create navigation messages to play to your callers. When a call enters the contact centre, it is first passed through the ACD system to check the rules for what happens to calls from that number – i.e. should they be passed to a specialist advisor? When a call enters the contact centre, it is first passed through the ACD system to check the rules for what happens to calls from that number. Then, if integrated, the call is fed into the IVR, which asks the customer to “press…” to identify what their reason for calling is. With this information, the call is directed by the ACD to the most appropriate advisor. Throughout this article, we have highlighted a great number of benefits that a modern ACD can give us, but here are two more that have not yet been mentioned. 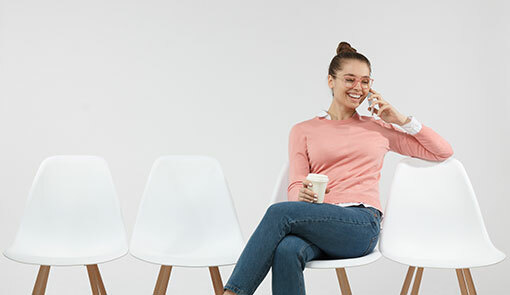 By integrating a modern ACD with your IVR system, you can better manage call queues by providing customers with estimated wait times and callbacks. The ACD will provide the data of how long the wait time is. This is then transferred to the IVR, which communicates the wait time to the customer, who then has the option of pressing a number to receive a callback. The callback works so that the caller’s place in the queue is saved by the ACD system and then, once the customer reaches the front of the queue, they get a callback. This prevents the customer from having to stay on the phone and listen to “that” hold music. Modern ACDs can function across multiple sites, which is great for business continuity. For example, if your contact centre is hit by a disaster, such as vandalism, snow or public transport disruption, advisors can work from home or you can move to another site without needing a separate ACD system. However, to attain this benefit, you must ensure that your ACD is a scalable, secure and reliable system that is capable of supporting such critical operations. Arguably the greatest benefit of an ACD is the technology’s ability to route customers based on advisor skills. However, a new technology is beginning to come to the fore that routes customers differently. Predictive routing is a technology that uses Artificial Intelligence (AI) to analyse all of a customer’s data against an advisor’s performance data and attributes. It then comes up with a forecast Net Promoter Score (NPS) for each interaction the customer could possibly have with every advisor in the contact centre. Based on these scores, the technology routes the customer through to the advisor they are projected to have the best rapport with. However, while this might be the future of call routing, for the foreseeable future the ACD systems will remain a fundamental piece of technology for the contact centre, due to the data it stores and all of the other benefits above. An ACD system is a technology that distributes contacts to various advisors within the contact centre based on the rules that are written into its algorithm. While the first ACDs could only pass a call on to the next available advisor, the technology has developed to cover a number of different channels and can route contacts based on a number of different factors. These factors typically include customer data, advisor skills and advisor availability; however, purpose of calling could also be a factor if the ACD is integrated with the IVR. Another integration that helps to maximise the potential of an ACD is to integrate with your CRM system and screen pop. This is because the ACD is not all about routing, it also contains valuable data, which – when integrated with these technologies – can better inform advisors during calls. However, some believe that while there are many benefits to installing an ACD system, predictive routing may one day take over, using AI in an innovative way. For now at least, though, the ACD remains a technology that is right at the heart of the contact centre.